Net Ball? Cirque de Soleil? 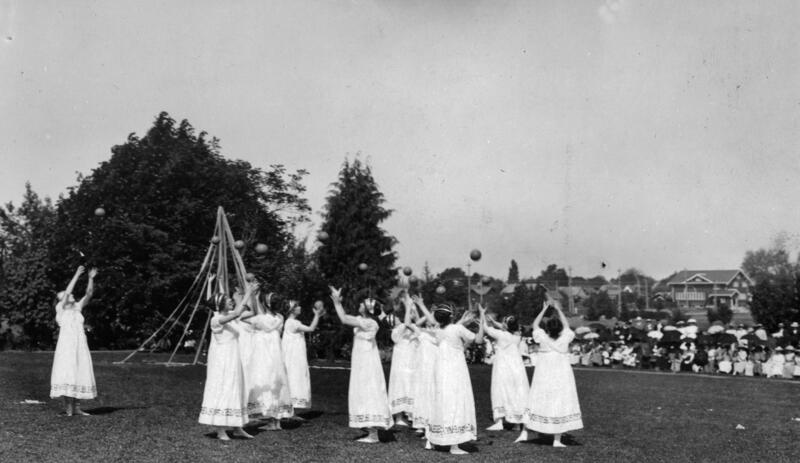 No– it’s a group of ‘Greek maidens’ celebrating May Day around the Maypole! It’s May–time for dancing around the Maypole….and time for the third issue of CJSM for 2015. We have quite a lot in store for you in this issue. We have made the Practical Management article on Concussion Management in Collegiate Student-Athletes : Return to Academics Recommendation the main Editor’s pick and set it free. There is a growing body of evidence on “Return to Play” from a concussion–but what should a student-athlete do about “Return to Learn”? Read the article and find out! Our second “Editor’s Pick” is an article on injury prevention in Aussie Rules Football: Bridging the Gap Between Content and Context: Establishing Expert Consensus on the Content of an Exercise Training Program to Prevent Lower-Limb Injuries. If it’s from Australia, and the subject is injury prevention, it is no surprise that one of the authors on this important contribution is Caroline Finch, the doyenne of Antipodean sport safety! This “Editor’s Pick” is free too. There is more, much more, including other familiar names from the world of sports medicine research. We’ve chatted up Chris Nowinski in the past on one of our podcasts–he is one of the authors in another offering on concussions: Concussion Reporting Intention: A Valuable Metric. Jim Borchers–whom we last caught up with shortly after his OSU Buckeyes had won the NCAA DI College Football Championship–has co-authored an interesting case report on a serious skin infection in a football player. One of the new aspects of CJSM in 2015 is our ‘Case Report’ section: now to be found on-line, a move which enhances the potential for multiple media (video, audio) to be posted as part of the descriptions of some of these cases. If you’re a subscriber but have historically loved the print version of the journal, don’t despair; but to get the case reports do go to the website or download the CJSM app on your iPad. Finally, and this blog post is by no means an exhaustive list of all May’s offerings, there is another interesting case report on a traction apophysitis in an adolescent athlete–found in a rather uncommon place. As a pediatric sports medicine physician I read this case from Stanford with great interest. We hope you enjoy this issue of the journal, and we hope spring has come your way in the Northern Hemisphere…or that you may be enjoying a mild Fall if you are Down Under.